A range of Masonic cufflinks and accessories for all occasions. Masonic items include cufflinks, tie clips, dress studs, masonic ties and masonic braces. Great gift ideas! Masonic cufflinks with mother of pearl inlay. Masonic cufflinks with blue or black enamel. A neat 9ct gold compass and square tie pin. Very effective on a plain tie. Masonic accessories dress set containing four studs. Onyx and rhodium. Masonic accessories dress set containing four studs. Mother of pearl. A pair of white gloves available in medium sizes. Plain black masonic tie with single white square and compass motif. Oval masonic cufflinks with compass and square. Available in two colours. 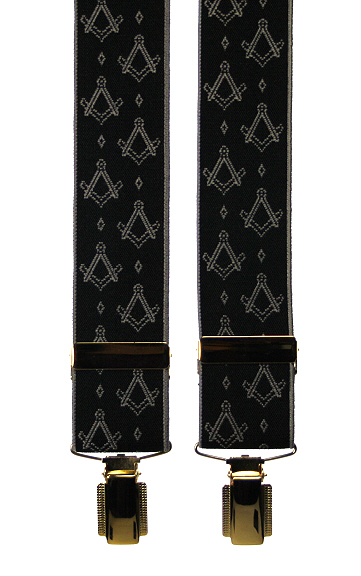 A pair of 31/2 cm elastic braces depicting masonic motif on a black background. Clip ends. One size fits all. Tie slide with gold masonic motif on blue background.